We had an unexpected visit on Saturday night and all day Sunday, from a tropical storm, that according to all the weather and hurricane forecasters had only a 10% chance of developing into nasty weather. I suppose no one thought to inform the gods in charge of the event. So glad I washed the windows yesterday! We had a restless night listening to the winds batter the house, and the rain squeeze in between the window casings, dripping onto the floors . I lay awake, mentally cataloguing all the things I had left outside mistakenly thinking we were only due for some rain; things like sofa cushions, the solar pool cover, and other assorted light objects that would make fine missiles in the wind. It would have been fool-hardy for us to attempt to retrieve our things while the wind raged. Our two cats disapproved of the wet floor. In the morning we were greeted by running water, cascading down two levels on our inside staircase from the rooftop to the kitchen below. The rooftop drains were clogged, and the water had breached the doorsill. When we opened the door into the kitchen, our two cats were perched on the furniture, meowing at us, convinced that their lives were in imminent peril. There was an inch of water on the floor and they couldn’t get near their food dish without getting wet feet. Oh my, such a tragedy! In Centro – rain, rain, rain on Sunday morning. 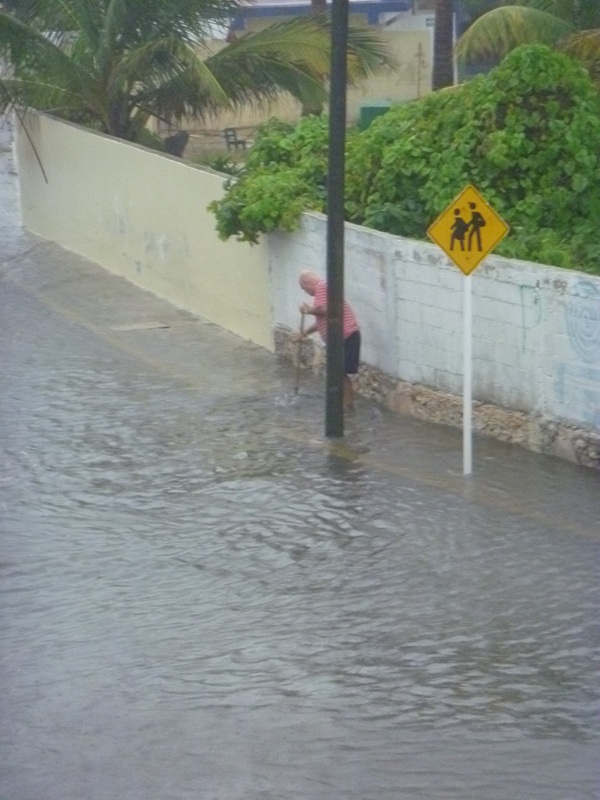 When most of us think of tropical storms or hurricanes we think of terrifying winds, torrential downpours, flooding, power outages, property damage, and unnecessary loss of lives ….. not good things. However, many meteorologists believe that tropical storms may more than offset the damage they cause by the good they do. Scientists already know that in such places as Japan, India, Southeast Asia, and Caribbean−even in the southeastern portion of the U.S.−tropical storms provide up to a third of the annual rainfall for drinking water, as well as refreshing wetlands and tidal areas behind the barrier islands. In the Yucatan peninsula – where we live – most of the domestic water supply comes from the underground rivers running beneath the limestone. This source is refilled by tropical storms and hurricanes. 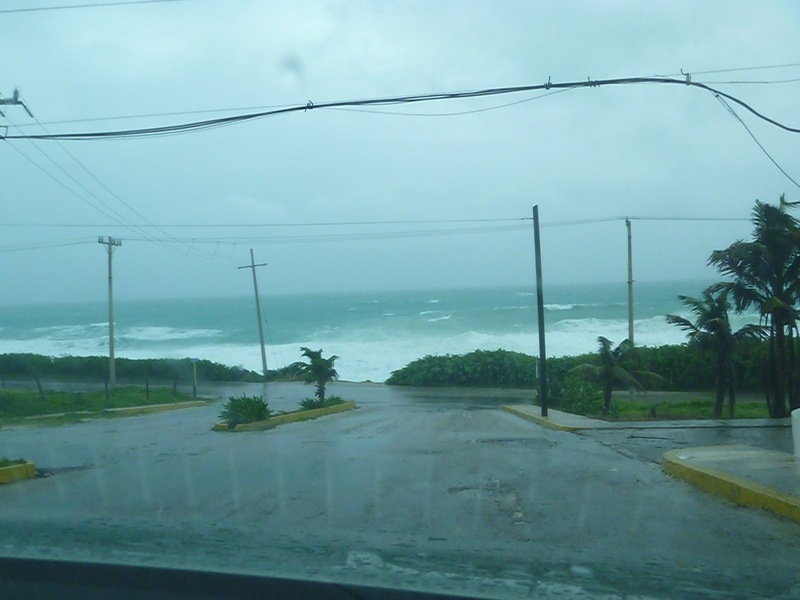 The rainfall associated with hurricanes also benefits the farmers in the hilly and remote areas of Mexico – providing much needed water for their crops, unless the rain becomes excessive, and then the farmers’ fields and homes can be washed away in the onslaught. It’s a pretty fine balance between good and evil. 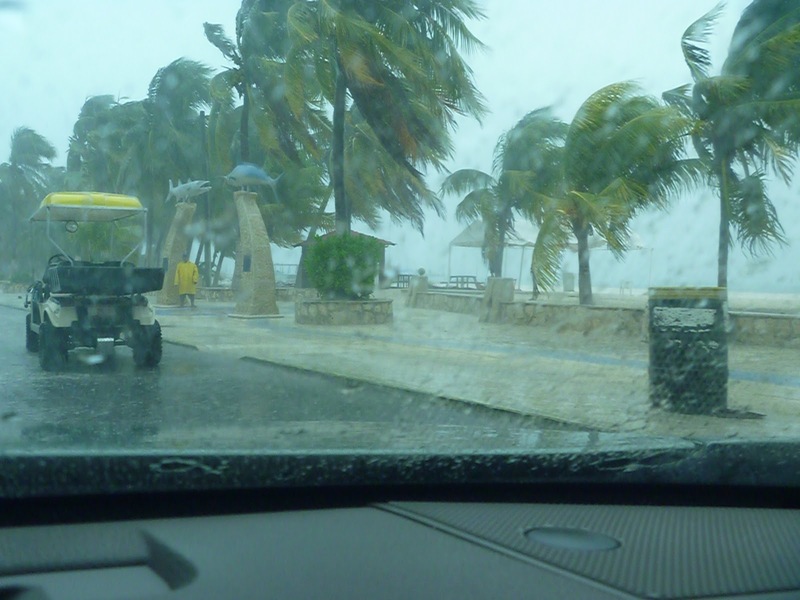 ﻿﻿﻿﻿﻿﻿﻿﻿﻿﻿﻿﻿Tropical storms are also a crucial factor in maintaining the planet’s heat balance. Meteorologists believe that the tropics will become warmer and warmer if some of this heat is not transported away from the tropics. Fortunately, the earth has some handy methods for carrying heat from the tropics toward the poles; about a third of this heat is distributed by ocean currents, a significant amount is transported by movement of the atmosphere, and a large portion of heat is picked up from the sea by tropical storms. 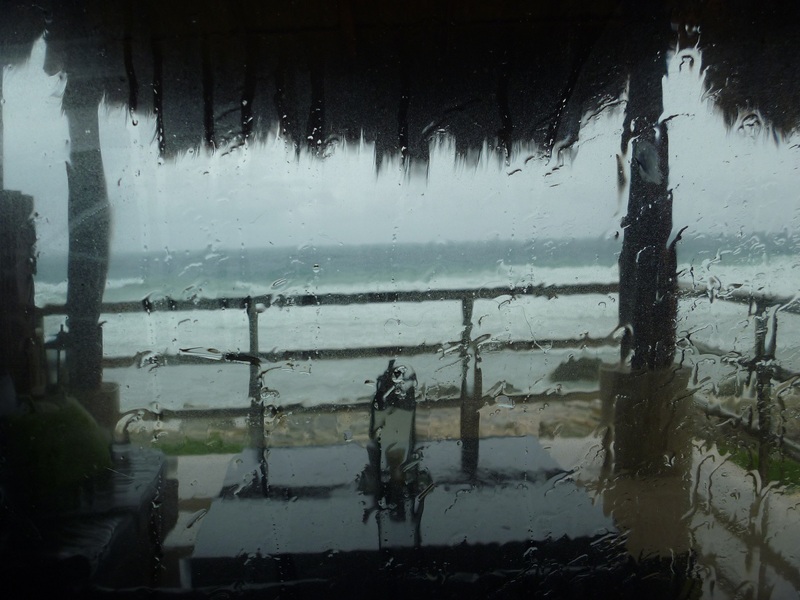 So, there are a number of benefits to nasty weather – but, I’m not sure it is the easiest way to get a kitchen renovation. 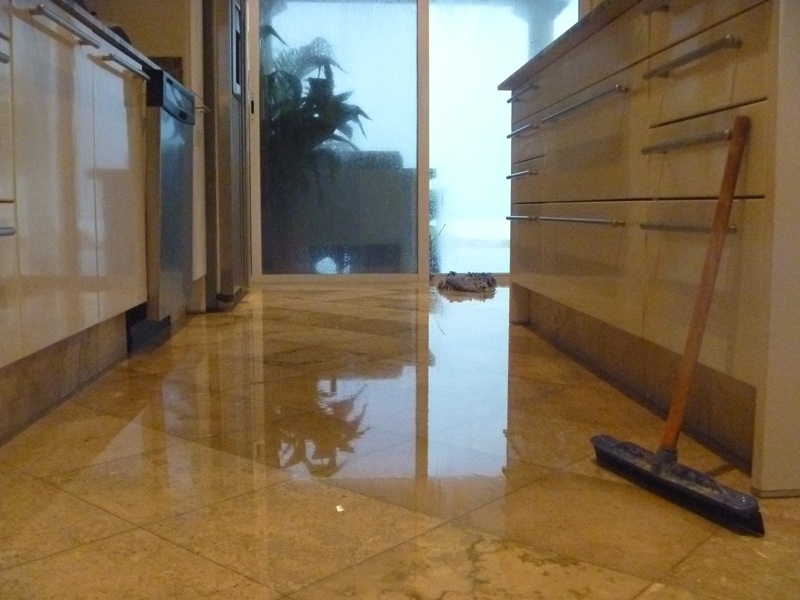 At least we only had a bit of water in the kitchen, no harm done – and it was a very novel way to wash our stairs. Hope you get it all dried out with no damage! I love rain since we live in Phoenix, but I have to admit, those tropical storms on Isla with 3 or 4 days of deluges get to me. Well darn, no sooner had I hit the 'send button' on my – yes we are drying out comment – and the rain started again. Just ran around pullling in patio cushions etc. Oh well, good exercise for me. Previous PostPrevious "It’s not my country, I am a guest!"